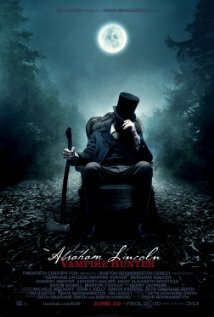 I tagged along with Lynn a few weeks ago when she saw Abraham Lincoln, Vampire Hunter. I’m kind of partial to the Hunter-types, considering that’s what I do. I sure wish I had a Hunter here to help me figure things out. As far as I know, I’m the only one around. At least ABE had a little teacher. Mentor-type. I did, for a few months when I first turned into what I am now, but the Vamps got him. So I’ve been on my own. But with Abe, his mentor was wicked-awesome. It was funny watching Abe in the beginning. Fumbling with his ax. Kind of like I did when I started learning how to use my dagger and crossbow. Brought back all kinds of memories. Anyway, back to the movie. I really liked it. The effects were amazing. Especially the fight scenes where Abe is taking it to the Vamps with his ax. The story was interesting, too. It kept me guessing most of the time, which I like. If I can figure things out right away, that just drive me nuts. What movies have you seen lately? What’s next on your list? This entry was posted in Uncategorized and tagged Abe Lincoln Vampire Hunter, Demons, Hunter, Hunting, Lynn Rush, New Adult, Vampires, Violet Midnight, Violet Midnight by Lynn Rush. Bookmark the permalink. I definitely want to see this. Looks interesting and finally a new take on a vampire movie. I didn’t get to see this but like Alex will watch it when it comes out on Netflix. I missed it in the theater but I will watch it on NetFlix.